Do you like the ancient culture, sights and attractions? Try to visit megalithic temples of Hagar Qim. Hagar Qim temple complex is located in the quieter and less populous parts of the island, along the south coast. 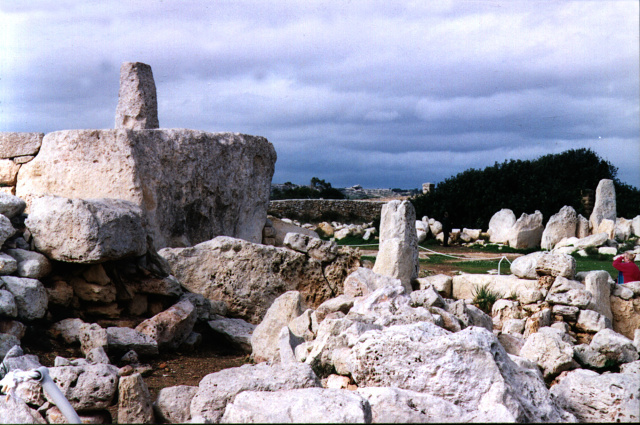 The most famous megalithic temple in Malta is situated near the village of Qrendi and it is virtually in the wild, at the top of the hill. The shrine was established in two phases around the 4th and 3 century BC and it consists of several parts. They are mostly upright stone slabs, at the main entrance is still 2 rows of stone gates that form an imaginary input. The main entrance is still in very good condition (whole temple was found, and then partially restored in the years of 1839 to 1909), each side has 3 megaliths. There are various altars inside of the shrine,…mainly made from a stone. The stone windows, carved into the oval hole the size of a man are also very interesting. The name Hagar Qim means: prayer stones. It includes two monumental megaliths. The first one stands above the other one with 6.4 m, the second overall dimensions of 4 x 7 x 0.6 m. Total estimated weight is 50 tones.